Cleaning email addresses is very simple if you know where to go. In Excel you can upload your list online and begin clean up. Here are the steps on how to do this and why. Real-time email verification and email cleaning services utilize list cleaning to remove bad emails. An email address is the first line of communication with a customer and should not be overlooked. Internet Service Providers, spam monitoring services, and business email protection like firewalls have become very effective in blocking you if your sending out too many messages to invalid email addresses. The solution to removing invalid emails is using a verification service to check all the email addresses on your lists before sending. Email-Checker is a web-based email verification service online that allows to upload a list and validate the email addresses in it. Considering most lists are in an Excel format, Email-Checker supports cleaning email addresses in Excel with our online tool. People find this very convenient so they don’t have to change list formats. In Excel, the CSV file format is the cleanest and easiest file type to manage your email lists in. On the Email-Checker.com dashboard you can upload your CSV file in Excel and begin the cleaning process in a few simple steps. After analysing the results of the millions of emails over the years we have verified, we set out to design a better email list leaning service that is more effective. We provide a user friendly email list cleaning service that will clean and scrub your existing email address database online. 1. 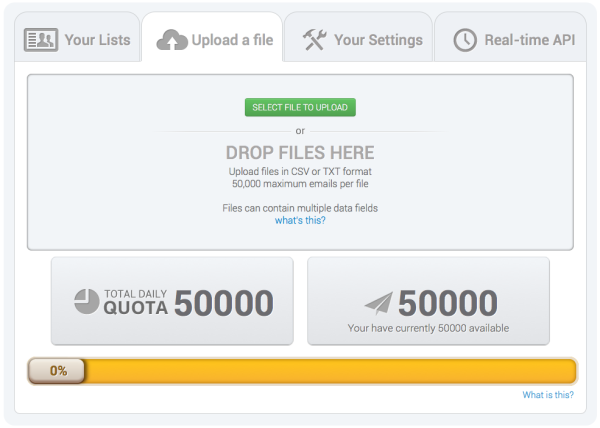 Upload files, up to 100,000 emails at a time. Drag and drop files in. Formats supported are .txt and .csv files. It is true, your files can contain multiple columns of data with Email-Checker. 2. Wait for the file to complete, then view the results. 3. Your lists are stored for up to 60 days, with the original filename preserved. This is the final step and keeps the entire process easy for you to understand when cleaning email addresses.